This is old version GO Launcher 2.15 apk for Android, you can install it if you want to downgrade or install old app. 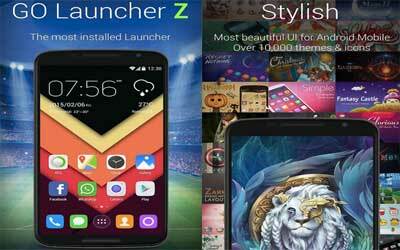 It is top Personalization apps from GO Launcher Dev Team. In fact, some of the themes allow you to position your icons in a circle to gain access to the applications by rotating and exploring them. You can also adjust the velocity of the displacement of the screens, or adjust some of the options that enables you to do it all with your fingers. Of course, many other themes can be downloaded for maximum customization to your liking. One of the biggest features includes the customization of your android’s font theme. For some people, it might not be a bother, but many others choose to change the default font displayed on the screen. Sometimes, you can do it automatically, but it all depends on the manufacturer and the version of Android you’re using. But even if you can’t, there’s always a guide to change the font theme. This means the customization itself is flexible and easy. With all said and done, GO Launcher for Android enables you to fully customize your Android device to your liking.